Healthy Bodies Physiotherapy offers group classes which are designed to target each individuals needs. We tailor a customised plan for each participant in the class, whether they will benefit most from specific exercise rehabilitation, Pilates or a combination. An initial assessment is required to obtain relevant medical history and design a program to target your individual needs. 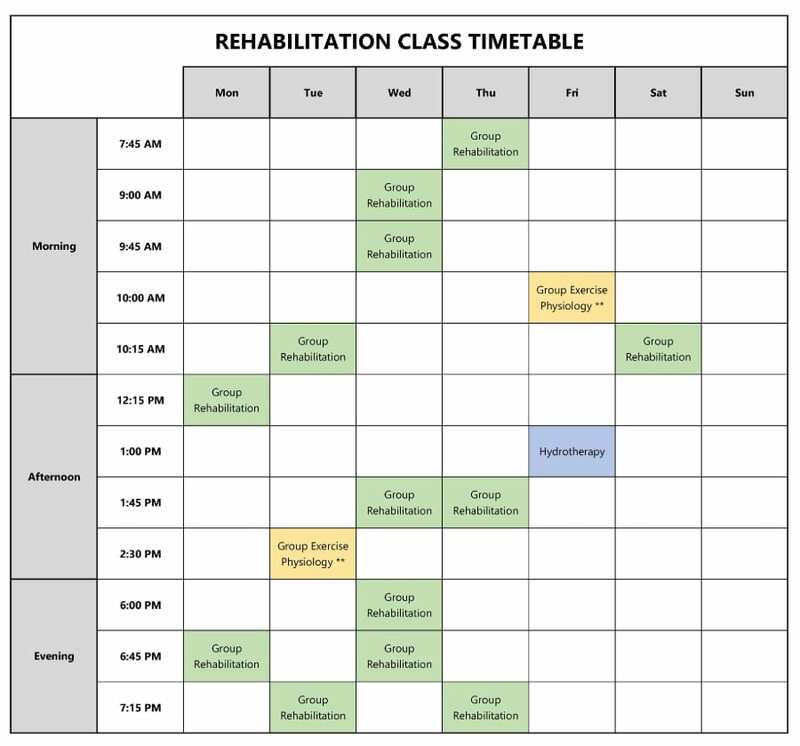 Our supervised rehabilitation and Pilates classes take a maximum of just 4 participants, so our physiotherapists can provide each participant with the individual attention they deserve. Classes empower patients to address factors contributing to their condition and gain long-term control over their health and well-being. This is done by correcting posture and technique (e.g. lifting, squatting), improving strength, balance, co-ordination and mobility and develop the confidence to train independently. Class sizes are limited to 4 participants to ensure our physiotherapists can provide each participant with the individual attention they require. Clinical Pilates exercises have long been known to improve core strength, flexibility, muscle tone and balance. At Healthy Bodies Physiotherapy our Clinical Pilates programs differ greatly from Pilates classes you may find in a non-clinical setting such as a gym or Pilates Studio. We individually design the program of each participant to ensure it specifically targets their condition and addresses the factors contributing to it. Our classes are commonly attended by patients recovering from issues their back, neck, or stiff joints (e.g. due to osteoarthritis) and pre and post pregnancy. Class sizes are limited to 4 participants to ensure our physiotherapists can provide each participant with the individual attention they require. Hydrotherapy classes are run at Don Tatnell Aquatic Centre in a pool heated between 32-34 degrees. Water provides a unique exercise environment that is versatile and suitable for patients of all abilities. Use in the right way and with the right exercise equipment, water can offer both assistance or resistance to movement making it the perfect place for you to start and progress your rehabilitation. Our experienced clinicians will meet with you at our clinic prior to you commencing your class to assess your condition and water confidence. A program will then be designed specifically to make your rehabilitation as effective and efficient as possible. We work closely with local GP Clinics, Dietitians and Diabetes Educators to run Diabetes focus groups from our clinic. The program is funded by Medicare with referral from your GP (to find out more about how to arrange a referral please contact our clinic on 9584 6919), so it is free to attend. During the focus group, you are provided with valuable information about how to better manage your diabetes through exercise and diet modification. Our experienced Exercise Physiologist will meet with you individually to define your goals and create an exercise program designed to ensure you meet them. The exercise program is conducted in our 60 square metre gymnasium under the guidance and supervision of our experienced team. Healthy Bodies Physiotherapy recognises that falls are a serious health problem. Current data suggests that 40% of people over the age of 65 will have a fall every year, with half suffering an injury as a direct result. Research has also demonstrated that this figure can be reduced by falls and balance prevention training. As a practice, we focus on the benefits of active rehabilitation and to help empower the client to take control of their health outcomes, an approach based on the current recommendations and evidence-based practice. Our Falls and Balance program delivers a well-rounded approach that reduces the risk of falling in our patients by improving their strength, balance and co-ordination as well as providing valuable information about how to eliminate falls risks at home. We guarantee that following participation in our program you will reduce your falls risk and improve your confidence about falling. This program is suitable for anyone with a history of falls, at risk of falls or with a fear of falling. An initial assessment is required to obtain relevant medical history and design a program to target your individual needs.